Brian Robinson swapped a humdrum but secure career on the south coast of England for the great jobless unknown in wildest Speyside. Today he is relishing his role as distillery host at Ballindalloch, Scotland’s ‘first single estate distillery,’ having previous headed up visitor operations at Glenfiddich. While Glenfiddich has the capacity to turn out 14 million litres of spirit a year, the comparable figure at Ballindalloch is just 100,000 litres. Brian Robinson has been hosting visitors to Ballindalloch distillery well before the site opened in 2015. 'I first became interested in whisky during the early ’90s as a result of a friend’s parents who owned timeshare at Cameron House Hotel by Loch Lomond. I holidayed there every year and never saw a bar bill. I thought Scotland was the most wonderful country on earth! 'We began visiting distilleries while staying at Cameron House and I just felt a real affinity with the Scotch whisky industry – on a consumption level, on a process level, and in terms of the great people you got to meet and spend time with. 'I was born and brought up in Portsmouth and believe me, pre-internet if you seriously wanted to find out more about whisky you really had to put some miles in. 'I ran the emergency services call centre for Scottish & Southern Electricity (SSE) in Portsmouth, and it was literally a case of waking up one morning and deciding I didn’t want to do that anymore. I couldn’t bear the idea of always thinking ‘I wonder what would have happened if I’d moved to Scotland?’ So in 2004 that’s what my wife, Jo, and I did. 'We got a cottage five minutes’ walk from Glenlivet distillery, with no prospect of work. My thinking was that I’d love to be involved with whisky, but I assumed there’d be a waiting list to work at distilleries. However, this wasn’t the case. 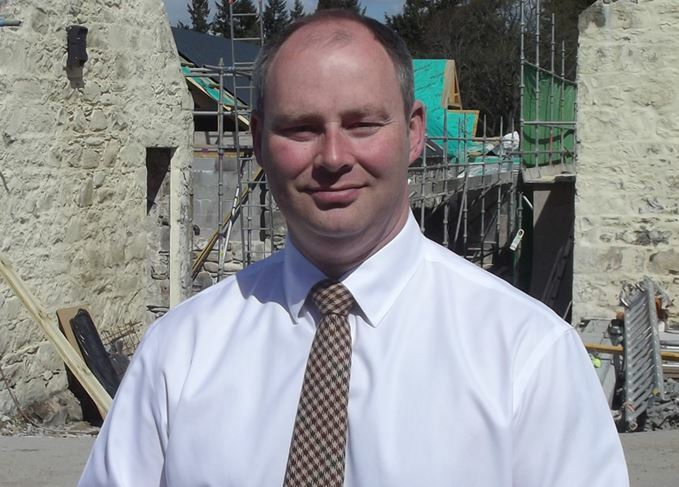 I got a job at Glenlivet as a tour guide, and after 14 weeks I became deputy supervisor. 'I stayed there until May 2006, when I was appointed senior guide at Glenfiddich. William Grant & Sons felt like a smaller company than Chivas, with fewer brands. It genuinely seemed more like the family company it was, and I felt I could play a bigger part there. I was made visitor centre team leader after I’d been there for 15 months and by the time I left I was looking after all front of house operations. I restructured the tours to include the high-end Pioneers’ Tour. 'It was all going fine and I was very happy, then the Ballindalloch opportunity came along. During my time at Glenfiddich I’d hosted a number of dinners at Ballindalloch Castle, home to the Macpherson-Grant family since the mid-16th century, and the owners, Oliver and Clare Russell told me of their intention of establishing a ‘single estate’ distillery. I had several conversations with Mr Russell about whisky-making, and after one dinner he asked me if I’d like to join the estate as distillery host. That was November 2013, and I didn’t go through a long thought process. In fact, I said yes immediately. 'There was clearly a risk involved in leaving what was at the time the biggest malt whisky brand in the world and a secure, well-established job and go to a distillery that had yet to be built. 'But I felt that I had enough experience and motivation that I could bring something positive to the evolution of Ballindalloch distillery. I was attracted by the traditional nature the family was trying to pursue. In December 2013 I met Oliver and Clare Russell’s son, Guy Macpherson-Grant, a member of the 23rd generation of his family to inhabit Ballindalloch Castle. He was to be a key player in creating the distillery, and I was made an offer the following month, starting in April. 'The distillery was officially opened in April 2015 and my remit now is to shape and formulate with the family where Ballindalloch sits in the great world of single malt whiskies. I’ve been able to influence decisions in a way I could only have dreamed of 10 years ago. 'In December we picked up Whisky Magazine’s ‘Craft Producer of the Year’ award and it was validation for us that we were heading down the right path. If I was building my very own distillery it would be almost identical to Ballindalloch. 'Ballindalloch is really just another facet of the sporting and agricultural estate rather than an out and out distilling business. This is like going back 150 years to what whisky was like then. It’s a small, old-style distillery, making a heavy Speyside character of spirit, using worm tubs for condensing purposes, rather than modern ‘shell and tube’ condensers. We’re aiming for an old Cragganmore/Mortlach style of whisky, something quite robust, which will make an ideal after-dinner malt, and should suit ex-Sherry wood well. 'We were very fortunate in not having to follow the same business model as most start-up distilleries, as the family was committed to the long-term nature of the business. We don’t have to do anything for short term gain that might cause long term pain. 'Other than a small amount of initial cask sales you will have to wait for around eight years before you get to experience Ballindalloch single malt. As Scotland’s first ‘single estate’ distillery, barley grown on the Macpherson-Grants’ Home Farm is malted and used in our whisky production. 'Working with a very small team is fantastic. I’ve been part of maturation planning and fork-lift truck driving. I take a turn at distilling and also double up as a warehouseman. I’ve never actually made whisky before, and I’m absolutely loving it. it’s really put the fun back into working in the world of Scotch whisky. Summer is all about cooking outdoors, from barbecues and picnics to terrace drinking and dining.